Peter Gunn passed the website www.chubbarchives.co.uk to The History of Locks Museum, together with associated tables, registers etc. 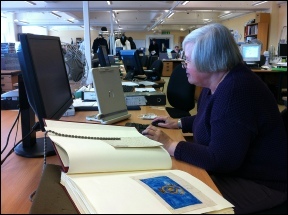 Some sections of the archives of Chubb and Son and predecessors (collection reference CLC/B/002) are available for consultation at London Metropolitan Archives (LMA) by prior appointment. Requests to view the records should be addressed to LMA. Contact details can be found on the 'Links' page. Since 2010 volunteers based at LMA have been item-listing in detail each document in the scrapbooks. As of February 2015 just under 15,000 item level descriptions have been completed which is an amazing feat. LMA wishes to thank all volunteers who have helped make this possible. The Chubb Collectanea (LMA catalogue series reference CLC/B/002/10/01) consists of 110 scrapbooks (originally held by the company as 48 numbered volumes) charting the history of Chubb and Sons from 1818 to 1980s, which were created by the company. These special volumes contain a rich variety of documents, cuttings, photographs and other items which are essential to our understanding of the development of Chubb and the security industry in the United Kingdom and beyond. There are limited indexes to this series and LMA therefore established a volunteer project to make this series more accessible. For more information please contact: ask.lma@cityoflondon.gov.uk 020 7332 3820. Lord Hayter’s 1828 lock on the Home page is unusual in not being marked with a serial number. 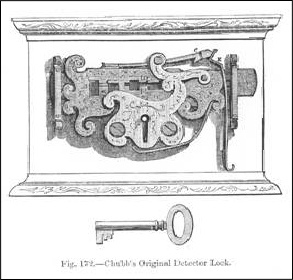 Housed in a leather bound presentation case, with the label shown on the right, this lock has been handed down through the Chubb family. It was thought to be the only one in existence and to have been individually made for Charles Chubb. An article in the Sept. 2004 Newsletter of the American Lock Collectors Association proved this was not the case. The picture in this extract from the ALCA article clearly shows a similar lock. The serial number 14858 is part of the inscription on the visible side of the bolt head. The owners contacted the Guildhall Library and were advised that lock number 14858 was dispatched to Hatton & Co. in Liverpool, on Dec.23rd 1837. I have no doubt this information appears against that serial number but we now know that several blocks of serial numbers were duplicated and I believe this lock was almost certainly made at about the same time as Lord Hayter’s. Major factors are the design of the detector mechanism and the bolt head inscription “Chubbs Improved Patent”. The 1833 New Patent introduced a completely new design of detector and lever shape. 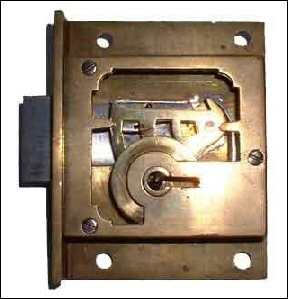 Although the label shown above states it was “made for the Bank of England”, the lock is obviously intended as a sample. 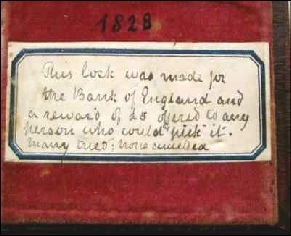 The belief is, having secured orders from England’s National Bank, Charles Chubb authorised production of several identical samples, with a view to securing similar orders from overseas. Only one of the keys shown above will operate the lock correctly. The other is a ‘false’ key. 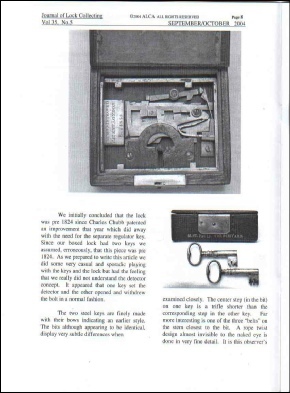 Throughout the 1800s Chubb produced samples of their different lock models with the lock case ‘cut-out’ to show the internal mechanism. Two keys were included, one of them being a ‘false’ key to demonstrate the function of the Detector mechanism. Providing a leather bound case gave them protection during transit to potential customers. This photograph shows a sample drawer lock from my collection. The serial number dates it to 1859. -SERIAL NUMBERS ON CHUBB SAFES, STRONGROOM DOORS etc. Although Chubb registered their first Safe Patent in 1835 they did not begin serially numbering their equipment until 1845, some eight years after opening the first manufacturing plant in London. The numbers were recorded along with details about the product and delivery arrangements. Chubb continued numbering all Safes, Doors and other Safe Works products until manufacturing ceased in Wolverhampton in the late 1990s. NOTE: THE EQUIPMENT RECORDS WERE NEVER PART OF THE CHUBB ARCHIVES. THEY WERE ALWAYS KEPT AT THE SAFE WORKS. - Serial numbers for Chubb, Hobbs Hart, Milner, Chatwood and Chatwood Milner. I have paperwork issued to Chubb Branch Offices during 1985 which provide details of serial numbers and the corresponding years of manufacture. These ‘sales memos’ include similar information for equipment made by the Hobbs Hart, Milner, Chatwood and Chatwood Milner Companies. If you have a serially numbered Chubb Lock or Safe, or a numbered product from any of the other companies mentioned above and wish to know the date of manufacture, we will do our best to answer your enquiry. 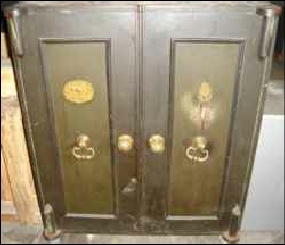 Chubb Safe circa 1859 - originally shipped to Melbourne, Australia.